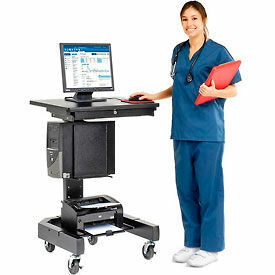 This mobile cart offers efficiency when tending to a patient. 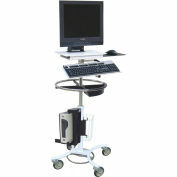 Easily fits through hospital doorways for computer portability. 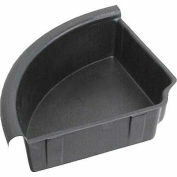 Includes steel post and base with plastic laminate work surface. 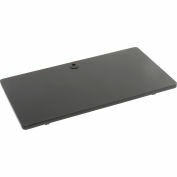 27"W x 20"D work surface is 1" thick and easily mounts at various heights. 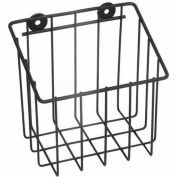 Durable 2" x 5" center post includes built-in cable management openings. 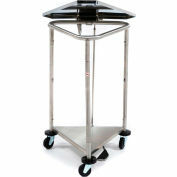 Cart moves easily on 24"W x 24-1/2"D caster base. 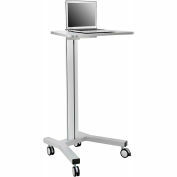 Base features a 19-1/2"W x 10"D shelf and 4" rubber casters (2 locking). 41"H overall. Black powder coat finish. Easy assembly. 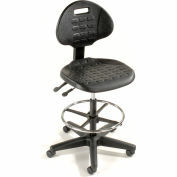 *Please Note: Optional CPU Holder (Item# 752148BK) and Locking Keyboard Drawer (Item# 706543BK) are not included. Your review: Really nice. Well built we have 4 of them. 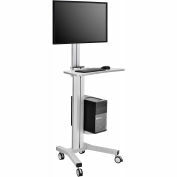 Your review: Great cart, sturdy but easy to roll around, in our environment we need a product that will last and this appears to be well built. Your review: The only 1 bad thing about this cart is they didn't put long enough screws to hold down the top. 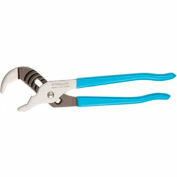 I replaced them with longer bigger screws and everything is fine. **sent to c/s 01/07. Pros: Allows you to move the computer around from place to place. Cons: Needs to have a back support option to hang the monitor on. 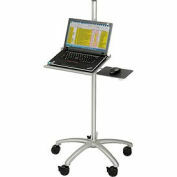 Otherwise you will need to clamp down the monitor to the desk. 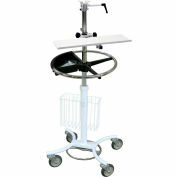 Your review: The medical cart is great. 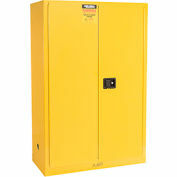 The material is heavy duty which is great. Would work great as a stationary station that has the option to be mobile. Pros: Material is heavy, which is great. Cons: It's too heavy to be constantly wheeled around. 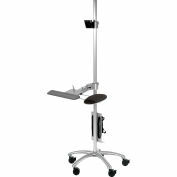 Our practice purchased this for a Nurse Practitioner that wheels around a laptop but her arm hurts from the constant dragging of this cart. 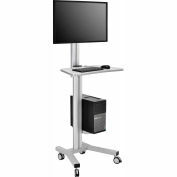 What are the optional accessories for the computer cart displayed? Can you also give me the part numbers and description for them as well? I can't determine them. Thank you. Hello Michael, the optional accessories for the computer cart are the locking keyboard drawer (model # 706543BK) and the CPU holder (model # 752148BK). Please see the link to view the model in beige: https://www.globalindustrial.com/p/office/computer-furniture/mobile-carts/mobile-computer-cart-beige-1. Thank you for your interest in our product.